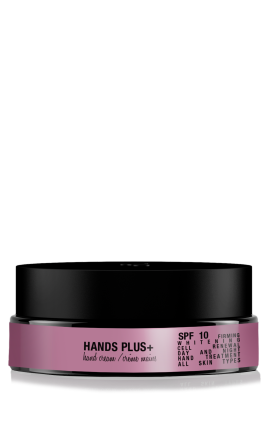 Hands plus+ was created with the aim to deliver the most advanced anti-ageing treatment for the specific treatment of hands, targeting the main problems that can be found. This is the reason why we have conceived a product that combines the most powerfull ingredientes of our concentrates: v6.4 FIRMING, v6.9 VOLUMISE and v6.12 WHITENING. This potent combination of active ingredients lies on a base of natural oils and butters, infused into a price award winner* a new generation of PEG-free emulsifier, creating a unique product that auto-adapts to skin type and climate with a white and luxurious. HANDS PLUS+ will perfectly adapt itself to different seasons of the year and also to different skin types, creating a non-greasy, non-sticky, easy-to-absorb finishing. HANDS PLUS+ nourishes while the skin feels light and smooth, providing a barely perceptible residual film that drapes the skin with comfort. 50 g.